The Western Pacific continued to be active this past week, spinning up yet another violent storm, which thankfully remained at sea and did not impact land. Nuri formed late last week west of Guam and slowly drifted west-northwest. It organized itself as conditions became ideal for strengthening of the typhoon: sea surface temperatures were very warm and wind shear was low. 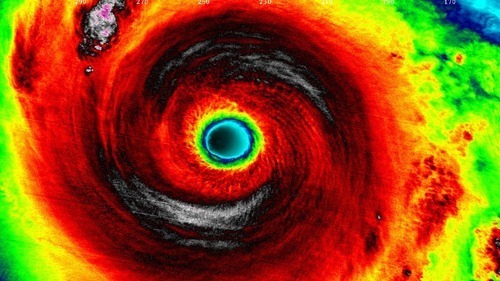 Nuri became a super typhoon last weekend as it deepened to a central pressure of 910mb and brought estimated sustained winds of 285km/h – similar conditions to what super typhoon Vongfong had at its peak this past October. Up to date, these two are tied for the strongest tropical storm of 2014. Nuri quickly curved Poleward before reaching Japan, sparing the Japanese islands from the storm. Nuri did not end there, however. 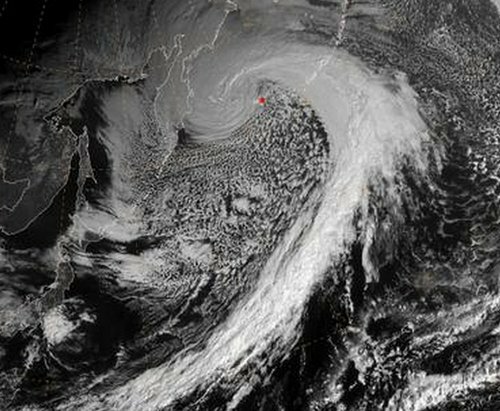 As it got captured by the polar jet stream, it transitioned into an extratropical storm. 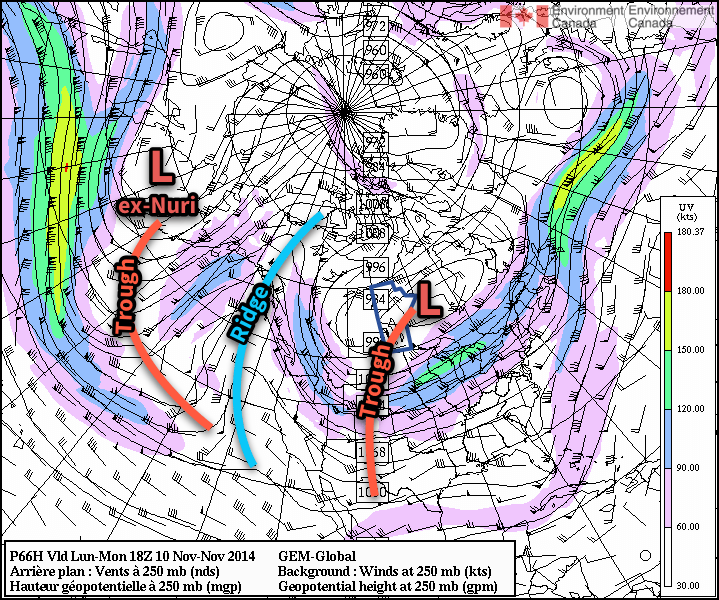 Extratropical storms are the low pressure systems that we see across the mid-latitudes, including here in Manitoba. They have significant differences from their tropical brethren, the most significant being that extratropical storms have warm and cold fronts that generate energy for the storm, as opposed to tropical systems that have generally uniform temperature. As the remnants of Nuri transitioned into the Polar Jet they strengthened once again, aided by a strong temperature gradient aloft. Projected wave heights on the Bering Sea neared 50 feet as the storm “bombed” out on Friday to a minimum pressure of 927mb. Extremely strong winds were recorded on the Aleutian Islands, where gusts exceeded 150km/h. Satellite picture of the remnants of Nuri as an extratropical storm on Friday. The remnants of Nuri are expected to continue moving towards Alaska but weaken significantly by the time they reach the Alaskan shores, as the low pressure system enters its weakening phase. The intense storm over the Aleutian Islands is also indirectly responsible for the outbreak of cold air expected in the coming week over much of North America. As the system intensifies over the Aleutian islands, a strong upper-level ridge will build over the west coast of North America which will cause a resultant upper level trough to deepen over the remainder of the continent. The GDPS shows prominent ridging over the west coast of North America, resulting in a deep upper-level trough over central & eastern North America. The deep upper-level trough will allow the cold air that’s been bottled up in the Arctic to spill southwards, resulting in well below seasonal temperatures across a significant portion of Eastern North America. The developing upper-level pattern is a fairly stable configuration for the flow, so no significant changes will likely occur in the next week or two other than gradual moderation.